I am delighted that 100 Words is still being carried on, now over at Thin Spiral Notebook. 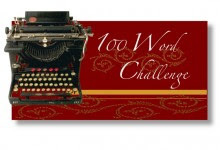 The 100 Words format was always fun to me - working with a topic I did not pick, in a strict minimalist flash fiction format. I felt it pushed my tendency to prattle on into an a la Hemingway strip-down. It is always fun, always invigorating. This round's prompt is HISTORY. I moved away thirty years ago. Had the house number not been the same I'd have thought I was in the wrong place. Nothing looked familiar. The aqua paint was replaced with taupe. The sled-hill front yard barely an incline. The pine tree was gone. Was my parakeet still buried under where it stood? Even the cement porch where I'd carved my initials as it set had been demolished at some point. I considered knocking on the door, asking if I could look around - but drove on. Sometimes history doesn't stay with a place - it stays with a person. Sadly, things do change as we grow up (or attempt too). I lived a block away, on the other side of some woods, from my elementary school (called grammar school back then). Behind the school where we played softball and football during recess were a couple of steep hills, like walls. One shorter than the other. The big hill was massive and we were cautioned not to climb up that one. Going back many years later, that massive hill was only seven feet high. Yep, perspectives change, too. And I understood and agree. Our memories are much better, most of the time, than what really was. I moved away from my "home" more than 30 years ago. When I go back to visit family and friends, I don't recognize anything. You're right you can't go home, but you also never leave it. I have been back to the last place I lived with my mother before I got married - entirely different. I almost knocked also. Instead I took a picture and then grounded myself - physically by touching the ground in front of my old home. All things change. I love your last line, Clew! Welcome back to 100 Words. (even though I am not there a lot).